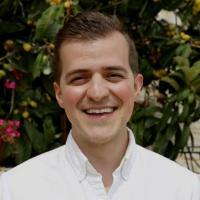 Matt Elia is a PhD candidate in the Graduate Program in Religion and a 2018-19 ACLS/Mellon Dissertation Completion Fellow. Working at the intersection of race, sexuality, and religion in American public life, Matt is currently completing a dissertation entitled Ethics in the Afterlife of Slavery: Race, Augustinian Politics, and the Problem of the Christian Master, which draws upon the resources of Black Studies to reexamine the problem of slavery in Christian political thought, particularly the modern reception of the thought of Augustine of Hippo. He recently presented the first sketches of his second project, The Porous Flesh of Black Thought: Ethics at the Border of the Human, in London at King's College as part of a conference on the work of Caribbean black feminist theorist Sylvia Wynter.